Following-up with their recent book publication Sneaker Tokyo, Shoes Master continues onward with their regularly scheduled programming as we see a preview of their upcoming Vol. 11 issue. 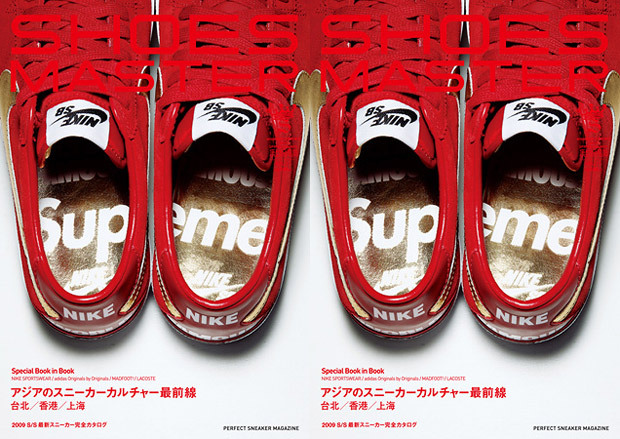 The front cover includes an initial glimpse into an upcoming Supreme x Nike SB collaboration. The table of contents also includes things such highlights revolving around Nike Sportswear 2009 Summer, adidas Originals by Originals, What is MADFOOT? and the 2009 collection from Lacoste Stealth. These go alongside usual magazine materials such as shop reviews and interviews. Available now at Gettry, but check your local import book store if you’re outside of Japan.